A 41 card mini-expansion to Sentinels of the Multiverse featuring a brand-new hero, Unity! A technopath, she uses her innate abilities to control technology and create mechanical golems to fight for her. 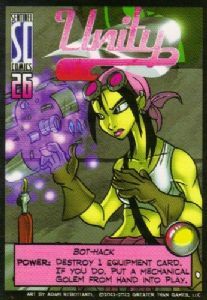 Unity is a standalone hero character with her own unique deck of 40 hero cards and a character card.